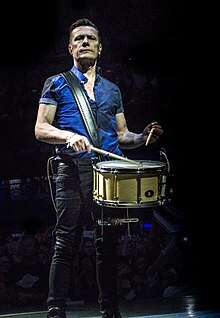 Lawrence Joseph Mullen Jr. (/ˈmʊlən/; born 31 October 1961) is an Irish musician and actor, best known as the drummer and co-founder of the rock band U2. Mullen's distinctive drumming style developed from his playing martial beats in a childhood marching band, the Artane Boys Band. Some of his most notable contributions to the U2 catalogue include "Sunday Bloody Sunday", "Pride (In the Name of Love)", "Where the Streets Have No Name", "Zoo Station," "Mysterious Ways", and "City of Blinding Lights". Mullen was born and raised in Dublin, and attended Mount Temple Comprehensive School, where he co-founded U2 in 1976 after posting a message on the school's notice board. A member of the band since its inception, he has recorded 14 studio albums with U2. Mullen has worked on numerous side projects during his career. In 1990, he produced the Ireland national football team's song "Put 'Em Under Pressure" for the 1990 FIFA World Cup. In 1996, he worked with U2 bandmate Adam Clayton on a dance re-recording of the "Theme from Mission: Impossible". Mullen has sporadically acted in films, most notably in Man on the Train (2011) and A Thousand Times Good Night (2013). As a member of the band, he has been involved in philanthropic causes throughout his career, including Amnesty International. As a member of U2, Mullen has received 22 Grammy Awards and has been inducted into the Rock and Roll Hall of Fame. In 2016, Rolling Stone ranked Mullen the 96th-greatest drummer of all time. Lawrence Joseph Mullen Jr. was the middle child and only son of Lawrence Joseph Mullen Sr. and Maureen (née Boyd) Mullen, was born on 31 October 1961 in Artane, Dublin, Ireland, and lived there, on Rosemount Avenue, until his twenties. His father was a civil servant and his mother a homemaker. He has an elder sister, Cecilia, and had a younger sister, Mary, who died in 1973. He attended the School of Music in Chatham Row to learn piano at the age of eight and, then, began drumming in 1971, at the age of 9, under the instruction of Irish drummer Joe Bonnie. After Joe's death, Bonnie's daughter, Monica, took over from him. But Mullen gave up the lessons and started playing by himself. His mother died in a car accident in 1976. Before founding U2, Mullen was involved for three weeks, on the suggestion of his father, in a Dublin marching band called the Artane Boys Band (now known as the Artane Band), contributing to the martial beats common in Mullen's work, such as "Sunday Bloody Sunday". Mullen lost interest again and left the band after they asked him to cut his shoulder-length hair. He saved money and his father helped him out to buy a drum kit made by a Japanese toy company, which was for sale by a friend of his sister Cecilia. He set up the kit in his bedroom and his parents gave him certain times to practice. Then his father got him into the Post Office Workers Band, which played orchestral melodies with percussion, along with marching band standards. He attended Scoil Colmcille, Marlborough Street, Dublin. He took the exams for Chanel College and St. Paul's, two Catholic schools his father wanted his son to attend. After the accidental death of Larry's younger sister in 1973, his father gave up the idea of pushing his son into those schools and sent Larry to Mount Temple Comprehensive School, the first interdenominational school in Ireland. Mullen's father suggested that he place a notice on the Mount Temple bulletin board, saying something to the effect of "drummer seeks musicians to form band." U2 was founded on 25 September 1976 in Mullen's kitchen in Artane. The band, originally consisting of Mullen, Paul "Bono" Hewson, David "The Edge" Evans, his brother Dik Evans, Adam Clayton, and Mullen's friends Ivan McCormick and Peter Martin, was originally known as the "Larry Mullen Band", but the name quickly changed to "Feedback", as that was one of the few musical terms they knew. McCormick and Martin soon left, and the band's name was changed to "The Hype". Just before they won a talent contest in Limerick, Ireland, they changed their name again, for the final time, to U2 at a farewell concert for Dik Evans, becoming the 4-piece band they are today. Mullen left school in 1978, having taken his Intermediate Certificate exams. The school offered him the chance to complete his Leaving Certificate exams. He and his sister Cecilia worked for an American company in Dublin, involved in oil exploration off the coast of Ireland. Mullen worked there for a year in the purchasing department, with the prospect of becoming a computer programmer in their geology section. In 2016, Rolling Stone ranked Mullen the 96th-greatest drummer of all time. People say, 'Why don't you do interviews? What do you think about this? What do you think about that?' My job in the band is to play drums, to get up on stage and hold the band together. That's what I do. At the end of the day that's all that's important. Everything else is irrelevant. In the early days of U2, his contributions to the band were often limited to fills and drum rolls, but he became more involved in the writing of the songs later, particularly in conjunction with Adam Clayton, his partner in the rhythm section, with whom he has collaborated on solo projects. When the band was first being signed to CBS Records, they refused to sign the band unless Mullen was fired. He was not, and as a result, his drumming became more integrated into the song structures. His experiences in the Artane Boys Band reportedly heavily contributed to the martial beat featured in many of U2's songs, helping to evoke military imagery. During the recording of the album Pop in 1996, Mullen suffered from severe back problems. Recording was delayed due to surgery. When he left the hospital, he arrived back in the studio to find the rest of the band experimenting more than ever with electronic drum machines, something driven largely by guitarist The Edge's interest in dance and hip-hop music, and, given his weakness after the operation, he relented, allowing The Edge to continue using drum machines, which contributed heavily to the album's electronic feel. Mullen has had tendinitis problems throughout his career. As a means to reduce inflammation and pain, he began to use specially designed Pro-Mark drumsticks. He uses Yamaha drums and Paiste cymbals. He was placed at # 21 in Stylus Magazine's list of the 50 Greatest Rock Drummers. Although he occasionally plays keyboards and synthesiser in concerts, Mullen rarely sings during performances. He contributed backing vocals to the songs "Numb", "Get On Your Boots", "Moment of Surrender", "Elevation", "Miracle Drug", "Love and Peace or Else", "Unknown Caller", "Zoo Station" and "Daddy's Gonna Pay for Your Crashed Car" (only during Zoo TV Tour), and others. He occasionally performed a cover version of "Dirty Old Town" on the Zoo TV Tour. During live performances of "I'll Go Crazy If I Don't Go Crazy Tonight", Mullen walks around the stage, contributing to the song with a large djembe strapped around his waist. Mullen is said to have a preternatural sense of rhythm. Brian Eno recounted that while working with Mullen on a U2 album, Mullen kept insisting that the click track was off and lagging behind the tracks that had already been recorded. Eno adjusted it, thinking that he was just humouring Mullen, but later found that Mullen was right and the click track had indeed been off by six milliseconds. Mullen has admitted his bass drum technique is not one of his strengths and has used a floor tom to his left to create the effect he wants (since The Unforgettable Fire era), using it for accents or in songs such as "With or Without You", "In God's Country", "One" and "Pride (In the Name of Love)". Speaking in 1995, he said, "When it came to recording 'Pride' for The Unforgettable Fire album, Danny [Lanois] was able to pick up from me that I had some interesting ideas but here was a slight lack of focus. My kick drum technique was then, as it is now, completely underdeveloped and I never got a chance to practice and learn like most people would. In the marching bands, I only used a snare and when I first got a kit, I never learned how to properly use all the elements together. So I went and listened to a basic demo of 'Pride' and tried to play a beat just using the kick and snare. But I couldn't get the kick to do what I wanted, so I got a floor tom down and did what I'd done in the past, which was if I couldn't physically do what was necessary, I'd find another way around it. I couldn't do what most people would consider a normal beat for the song, so I chose alternatives." Mullen has worked on many solo projects in his career, including collaborations with Maria McKee, Nanci Griffith, and U2 producer Daniel Lanois. In 1990, Mullen co-wrote and arranged an official Irish national football team song "Put 'Em Under Pressure" for the FIFA World Cup. He played drums on many of the songs on Emmylou Harris' 1995 album, Wrecking Ball. Mullen and Adam Clayton recorded the soundtrack to the 1996 movie of Mission: Impossible, including the theme song, whose time signature was changed from the original 5/4 time signature to an easier and more danceable 4/4 time signature. The "Theme from Mission: Impossible" reached #8 on the U.S. Billboard chart, and was nominated for a Grammy award in the "Best Pop Instrumental Performance" category. He worked with producer Daniel Lanois on his album Acadie. Mullen and Clayton collaborated with Mike Mills and Michael Stipe from R.E.M. to form the one-performance group Automatic Baby, solely for the purpose of performing "One" for Bill Clinton's inauguration at MTV's 1993 inaugural ball. The group's name refers to the titles of both bands' latest albums, Achtung Baby and Automatic for the People. He performed on Underworld's song "Boy, Boy, Boy" from their 2007 album, Oblivion with Bells. Ten years later he appeared on Alice Cooper's 2017 album Paranormal. Mullen's film debut was in a film by Phil Joanou called Entropy where he played himself alongside bandmate Bono. He played a thief in Man on the Train, which starred Donald Sutherland. Filmed in Orangeville, Ontario, Canada, Man on the Train was released in 2011. The following year, it was announced that Mullen would appear in his second film, A Thousand Times Goodnight, starring Juliette Binoche. On 3 September 2013 the film won Special Grand Prix of the Jury at Montreal World Film Festival. We all have views on what our Irishness means to us. Two members of the band were born in England and were raised in the Protestant faith. Bono's mother was Protestant and his father was Catholic. I was brought up Catholic. U2 are a living example of the kind of unity of faith and tradition that is possible in Northern Ireland. Mullen met his partner, Ann Acheson, in their first year in Mount Temple. The two have been together for over 40 years and they have three children. He is a first cousin of Irish actor Conor Mullen. As U2 became increasingly successful, Larry Mullen had to add the suffix "Junior" to his surname to avoid confusion with his father, who was receiving large tax bills meant for his son. In 1995, Mullen had surgery on his back because he had been carrying an injury since The Joshua Tree tour. He and Clayton own houses near Bono and The Edge in Southern France to make it easier to record with U2 in the south of France. He prefers to let the other band members take the spotlight at interviews. He has played synthesiser or keyboards on several songs, including "United Colours" from Passengers' 1995 album Original Soundtracks 1, an album that Mullen has always disliked. In the 1980s, The Prunes gave him the nickname of "The Jam Jar'". Yamaha Phoenix (PHX) in Silver Sparkles: (Since the U2360 tour. Previously he used Yamaha's Maple Custom and Birch Custom Nouveau drums in the same sizes). 16"x16" floor toms x2 (one left of the hi-hat, one right of the snare drum for the Vertigo tour). For previous tours, he used an 18"x16" floor tom to the left of the hats. 14"x7" Brady Sheoak Block — primary snare drum on the Vertigo tour. For ZooTV and Elevation tours, he used a 12"x7" Sheoak block snare. For Popmart, a 14"x6.5" Jarrah block primarily. Depending on the gig, he sometimes used a 14"x6.5" Jarrah ply snare instead of the block snare. 24"x16" kick drum. 22"x16" Kick on the b-stage during ZooTV only. Pro-mark 5A Japanese oak drumsticks. Mullen and U2 have won more than 60 awards, including 22 Grammy Awards. At the Grammy Awards, the band has won Best Rock Duo or Group with Vocal seven times, Album of the Year twice, Record of the Year twice, Song of the Year twice, and Best Rock Album twice. ^ a b c d e f g Colombaro, Sherry. "Larry Mullen Jr. profile at atu2.com". U2 Online. Retrieved 15 September 2007. ^ a b U2 Wanderer. "Mission:Impossible Soundtrack Album". U2wanderer.com. Retrieved 8 September 2007. ^ "Larry Mullen Jr. biography at". U2Online. Archived from the original on 13 November 2007. Retrieved 15 September 2007. ^ Conner, Thomas. "True Blue to U2". Chicago Sun-Times. Retrieved 15 September 2007. ^ a b Matt McGee. "U2 biography". @U2. Retrieved 15 September 2007. ^ Diehl, Matt; Dolan, Jon; Gehr, Richard; et al. (31 March 2016). "100 Greatest Drummers of All Time". Rolling Stone. Retrieved 31 March 2016. ^ Flanagan, Bill (1995). U2 at the End of the World. Delacorte Press. p. 15. ISBN 0-385-31154-0. ^ a b c Cunningham, Mark (April 1995). "The Larry Mullen Jr. Interview". U2 Propaganda (22). ^ Tingen, Paul (July 1997). "Pop Art: Flood & Howie B". Sound on Sound. Archived from the original on 7 June 2015. Retrieved 29 September 2009. ^ "Stylus Magazine's 50 Greatest Rock Drummers". Retrieved 16 September 2007. ^ Austin, Steve (17 September 2009). "Review - U2 360 Tour - Toronto - Night One - Sept. 16, 2009". CityNews. Retrieved 26 September 2009. ^ Bilger, Burkhard. "The Possibilian". Retrieved 20 July 2011. ^ Flick, Larry (27 April 1996). "Mission: Impossible Theme Mixes Suspense, Funk". Billboard. Retrieved 8 September 2007. ^ U2wanderer.com. "Adam Clayton solo discography". U2wanderer.com. Retrieved 8 September 2007. ^ "Larry Mullen Solo Projects Listing". u2wanderer.org. 2013. Retrieved 16 July 2013. ^ Scheib, Ronnie (16 September 2013). "Montreal Film Review: 'A Thousand Times Goodnight'". Variety. Retrieved 30 October 2013. ^ "A Thousand Times Goodnight wins Special Grand Prix of the Jury at Montreal World Film Festival". Irish Film Board. 3 September 2013. Archived from the original on 29 January 2016. ^ "Original Soundtracks 1 information". U2wanderer.org. Retrieved 5 August 2010. ^ a b c d "U2's drum setup in pictures: Larry Mullen Jr's 360° Tour kit revealed". Rhythm magazine. 18 July 2011. Retrieved 2 January 2016. ^ a b "Grammy Awards". Archived from the original on 17 January 2010. Retrieved 23 September 2007. Awards for Larry Mullen Jr. This page was last edited on 16 April 2019, at 03:58 (UTC).